They've been busy, um, wolves down at their Bayside brewery in recent weeks. This is the third new can we've had from Wolf Of The Willows in a month, all featuring artwork by their illustrator buddies BySequence and Studio Worldwide, and the second of them to involve collaborators. 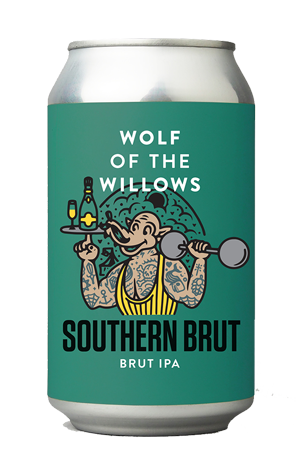 This time around, Southern Brut was conceived in conjunction with Ale Of A Time and the Patreon supporters of their podcast. It's one of the first (although certainly far from the last) of a new style of IPA to be brewed Down Under: the Brut IPA first released by Social Brewing in San Francisco. It's a style in which the intention is to create an IPA that's bone dry, but still bursting with hop character, and is typically achieved either by using an amylase enzyme or champagne yeast. In this case, they've taken the former route and then given it some local flavour by adding what they're calling "a massive double dry hop" at the start of and post fermentation; they opted for Kiwi and Aussie hops Nelson Sauvin, Motueka and Galaxy, all known for their potential to give a beer intense citrusy and tropical fruit characters. The outcome? Well, while we wouldn't say it's bone dry, it's certainly delicious, and the cause of it not coming across as bone dry is a welcome one. It appears that the process has drawn so much hop oil from those late additions that there's a fruity sweetness at play; it doesn't appear to be so much a malt sweetness as one derived from the flavour and aroma compounds in the hops. Thus, you have a beer awash with tropical and citrus characters and a pleasingly rounded body too. Given our limited experience of such beers to date, it's impossible to say whether this is exactly what a Brut IPA should be; but can we have another one anyway, please?